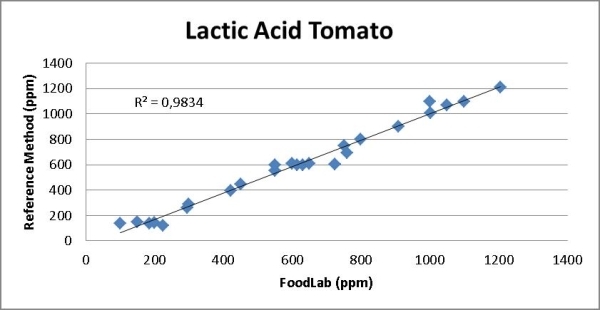 Analyzing the D-lactic acid in tomato is a specific need of the companies that sell tomato pulp or that use ita as an ingredient for other food products. The method that is generally used for the analysis forsee a long and complicated sample treatment that has to be done in a chemical laboratory. Here the use of the spectrophotometer, particularly turbidity sensitive, imply an extremely elaborate sample treatment. At the request of a large food company the CDR R&D laboratory tried to apply the CDR FoodLab® method to this parameter as well. Indeed the CDR FoodLab® analysis system already allows to analyse in an easy and rapid way the L-lactic acid in tomato, fulfilling the need to analyse this parameter directly at line production. The CDR R&D laboratory started to work on some company’s samples: tomato, tomato paste (double and triple concentrated) and tomato sauce. After a first analytical phase a reagent has been created, the “DL” reagent, able to determine through enzymatic reaction both of the enantiomers of lactic acid. Afterwards a correlation curve perfectly in line with the reference standards has tuned up. The test with the CDR FoodLab® system allows to obtain the L-lactic acid and D-lactic acid values as the sum of the two values and as distinguished values of both L-lactic and D-lactic acids. That implies, compared with the reference analysis method, the advantage of simpler and more rapid analysis performance, without wasting the first matter. The new lactic acid (D+L) analysis is reference method compliant, but it differentiates for its simplicity and rapidity: the enzymatic method that is generally performed in a chemical laboratory requires indeed the use of a spectrophotometer very sensitive to the turbidity of the samples. It is why the sample treatment is long and complex and requires the use of big quantitues of tomato pulp. With the CDR FoodLab® analysis system all of that can be avoided without losing accuracy and reliability of the results. CDR FoodLab® system can be set-up in an existing area with some bench straight away in only 5 minutes. It can perform 14 tests analysis session in about 15 minutes. D and L lactic acid analysis in tomato straight at line – tomato analysis was last modified: May 25th, 2017 by CDR s.r.l.